I forgot how I last time started postgres (it was months ago) and I don't remember where the data directory is located at. The postgres command seems to require to location. I'm on MacOsX if that helps. If the server is not running and you forgot where the data directory was, then you really have to guess yourself. An operating system specific convention or the shell history might provide hints. This might be a brew-specific thing, though; without brew I don't know what it shows. On Ubuntu\Debian, try the pg_lsclusters command. Modern versions of the PostgreSQL desktop client for OSX have a convenient "Server Settings" dialog that will allow you not just to list the data directory but open it directly. Very useful if you experience a random machine crash that leaves behind a lock file. On OS X 10.9 Mavericks, this is the output I get from that, which includes the data directory. 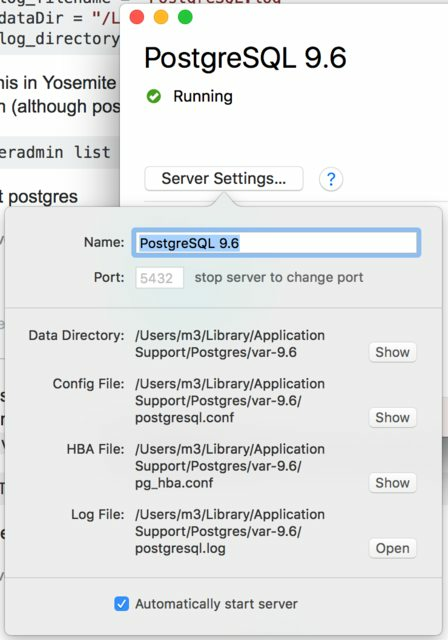 I just tried this in Yosemite (OS X 10.10) and postgres is no longer listed as a service under serveradmin (although postgres is installed). That was the answer I needed. ps -e |egrep postgres|egrep -E '[[:blank:]]+\-D'| perl -pe 's/^.*[[:blank:]]+-D[[:blank:]]+(\S+).*?$/$1/'. This would work most of the time. It would return something like /usr/local/pgsql/data or wherever else it was specified in the parameters of PostgreSQL at launch. Navid is a new contributor to this site. Take care in asking for clarification, commenting, and answering. Check out our Code of Conduct. Not the answer you're looking for? Browse other questions tagged postgresql mac-os-x or ask your own question. which postgres do i have installed? what directory needs to be in my path to run initdb? How to (re)start Postgres on Windows command line in background? Could someone explain bizarre behavior executing millions of UPDATES?